William Harvey was an English physician, a pioneer in the study of blood circulation and embryology, and the founder of experimental physiology. Educated in Cambridge, England, and Padua, Italy, he practiced medicine in London and was court physician to King James I and King Charles I.
William Harvey (right) with Charles I (seated, left). The Roman physician Galen (129–c. 199 C.E.) had argued that the liver received food from the small intestine and converted it to blood, the heart pumped this blood to the other organs, and those organs consumed it. Harvey, refusing to accept this, measured the amount of blood pumped by the hearts of snakes and other animals. He concluded that (1) the heart pumps more blood in half an hour than there is in the entire body; (2) animals do not consume enough food to account for so much blood; and (3) the blood must be continually recirculated around the body, since the planets orbit the Sun and (he believed) the human body is modeled after the solar system. So for a mixture of scientific and superstitious reasons, Harvey correctly deduced that after blood leaves the heart it returns there rather than being consumed. He predicted that there must be a connection between the arteries and veins so blood could get back to the heart. Such connections, the capillaries, were first seen by Antony van Leeuwenhoek and Marcello Malpighi after Harvey's death. Harvey published his conclusions in the book Anatomical Studies on the Motion of the Heart and Blood in Animals (a translation of its Latin title) in 1628. Harvey's contemporaries were so wedded to the ancient beliefs of Aristotle and Galen, however, that they ridiculed his conclusions. How could the blood serve any purpose, they argued, if the organs did not consume it? Harvey's reputation survived this skepticism, however, and he went on to do important work in embryology. Harvey was forced to flee for his life in 1642, and his home was ransacked and his records destroyed in a rebellion against the British monarchy that ended with the beheading of his patron, King Charles. Depressed by this turn of events, Harvey gave up his medical practice and retired to the countryside. Nevertheless, at the urging of friends, he resumed work. Harvey rejected the belief that animals can arise from decaying flesh, and argued that every animal, including humans, arises from the union of sperm and egg. In 1651 he published this theory of animal development, with a detailed account of the embryology of the chick, as Studies on the Generation of Animals. The frontispiece of his book bore the inscription ex ovo omnia —everything [comes] from an egg. Harvey died of a stroke in 1657, honored by his country and wealthy from the income on his books. Durant, Will, and Ariel Durant. The Story of Civilization, Vol. VII. New York: Simon & Schuster, 1961. Marcus, Rebecca. 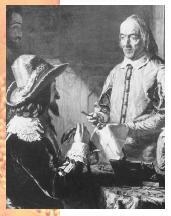 William Harvey, Trailblazer of Scientific Medicine. New York: Franklin Watts, 1962.